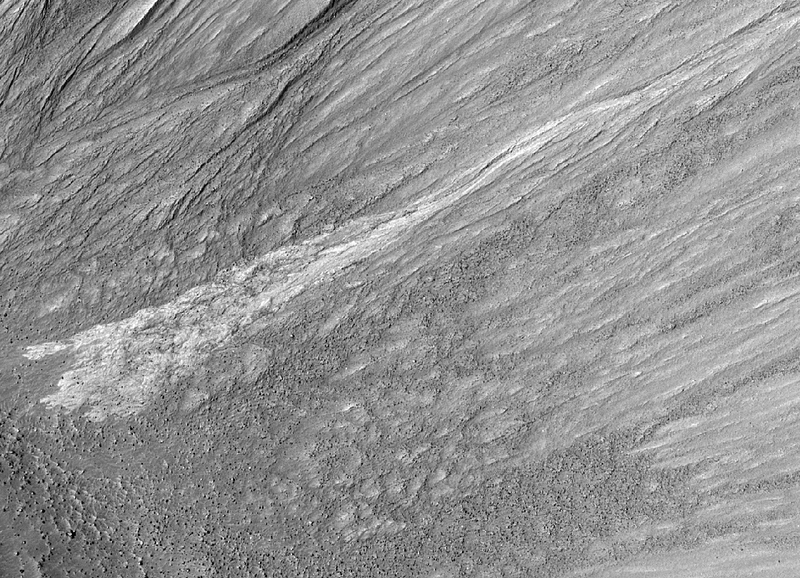 This image shows a bright gully deposit and other gullies within a crater wall in Terra Sirenum (37.7 degrees South, 229.0 degrees East). Three images are available: A) The full frame HiRISE image, with the crater at left center; the width of the image is 6 kilometers; B) enlargement showing the crater; and C) a close-up of the bright gully deposit. Frames B and C have been stretched to enhance contrast. 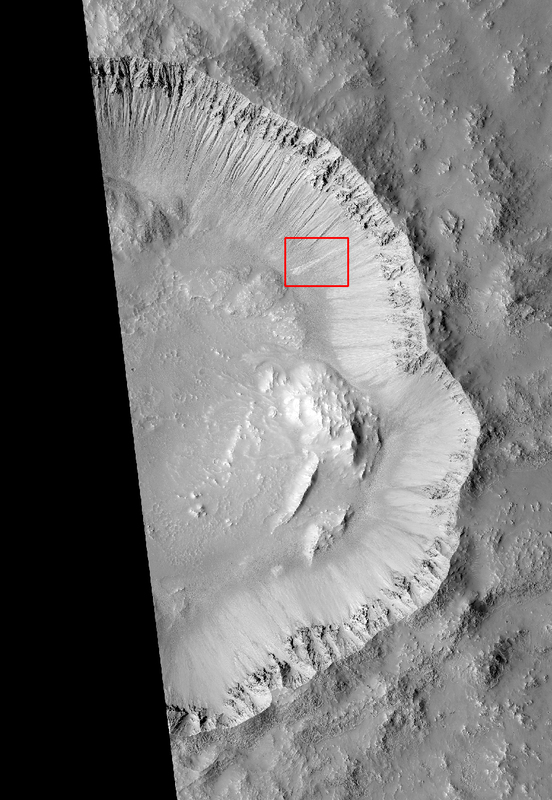 The red box in B shows the location of C.
As seen in A and B, the appearance of the crater wall differs between the northern and southern sides. On the Northern pole-facing side walls, prominent gullies with channels and aprons are apparent, with many of these having valley-like alcoves near their tops. The morphology of the gullies is consistent with formation by a fluid, most likely water. On the pole-facing slopes, ground ice or aquifers may be more stable, being subjected to less heating from sunlight compared to equator-facing slopes. In contrast, the southern, equator-facing walls are dominated by rocky debris flows that lack prominent channels. The bright gully deposit has a very fluid-like appearance, and has not been covered by other gullies or debris flows, indicating a young age. The brightness is a mystery; it could be due to minerals formed from water or ice. Alternatively, the flow that made the gully may have removed a thin coating of relatively darker dust and soil, revealing a brighter substrate. 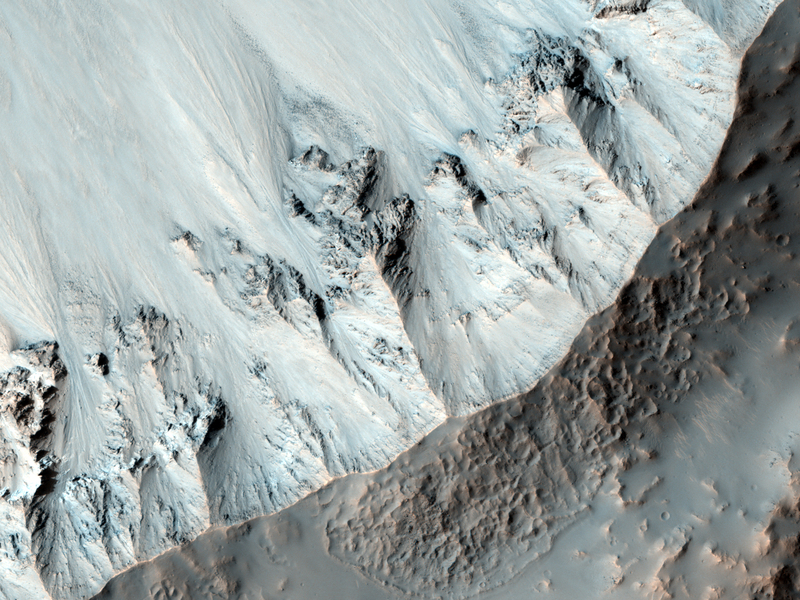 In any case, this feature is probably indicative of recent flow of water or water-rich material on Mars. This is a stereo pair with PSP_003674_1425.